The University of Maryland, home to one of America’s leading quantum science and technology communities, suggested language and advocated for the National Quantum Initiative legislation that now has passed Congress with strong bipartisan support. The bill has gone to President Donald Trump for signature. 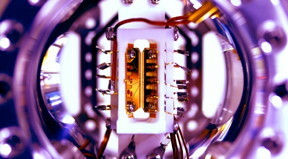 The National Quantum Initiative Act closely follows the National Quantum Initiative Action Plan prepared earlier this year under the guidance of University of Maryland Distinguished University Professor of Physics Christopher Monroe, CEO of the quantum computing startup IonQ, and of University of Oregon Professor of Physics Michael Raymer. Monroe and Raymer are founding stakeholders and active participants in an organization of academia and industry convened by the National Photonics Initiative, a broad-based collaborative alliance that has been working to raise awareness of the vital importance and benefits of science and technology in areas of quantum science, optics and photonics. The National Photonics Initiative (NPI) shared the National Quantum Initiative (NQI) Action Plan with lawmakers earlier this year, and Monroe, Raymer and the NPI have been working to advance and support congressional approval of a National Quantum initiative. The U.S. House and Senate have passed the National Quantum Initiative Act, advancing the bill to the president’s desk. The National Quantum Initiative legislation—introduced by Congressman Lamar Smith (R-TX), Congresswoman Eddie Bernice Johnson (D-TX), Senator John Thune (R-SD), Senator Bill Nelson (D-FL), Senator Lisa Murkowski (R-AK), and Senator Maria Cantwell (D-WA)—will establish a National Quantum Coordination Office inside the White House’s Office of Science and Technology Policy to help coordinate research between agencies, serve as the federal point of contact and promote private commercialization of federal research breakthroughs over the next decade. The bill authorizes $1.275 billion over 5 years for quantum information science research and development across several federal research agencies, including the Department of Energy, the National Institute of Standards and Technology, and the National Science Foundation. Funding will support the establishment of major research centers run by academic institutions, industry, government labs and others to advance quantum information science, develop cutting edge technology and train the quantum workforce of tomorrow. Exponential growth in the power of information technology – Moore’s Law – has long catalyzed U.S. productivity and economic growth. However, this growth is now slowing as the 1950s-1960s scientific breakthroughs in computer science, optics, photonics and other areas reach their technological limits. The demise of rapid doubling of computing power known as Moore’s Law has mobilized the science and industry communities to search for radically new approaches to information processing. Advances in quantum science and quantum technologies, including many made at the University of Maryland, are based on fundamental particles of nature, such as individual atoms and photons. These advances are natural targets for new revolutions in information science because they hold great promise to become the computers, networks and sensors of tomorrow. Quantum information science is based on exploiting subtle aspects of quantum physics, such as “quantum superposition” and “entanglement,” for valuable, real-world technologies. These technologies have the potential to tackle the hardest computational problems and enhance a wide variety of sensor- and communication-based systems. a quantum-focused National Science Foundation Physics Frontier Center was first awarded to UMD in 2008 and renewed in 2014. NSF’s prestigious Physics Frontier Centers promote collaborative exploration of challenging physics questions. IonQ, a quantum computing startup located in College Park and co-founded by Monroe and Jungsang Kim, an engineering professor at Duke University. IonQ builds full-stack quantum computer systems shown to be among the most powerful in the world.